Central Park's Conservatory Garden: the North Garden, seen from its “back door”. In September 1937 the Conservatory Garden at 105th Street and Fifth Avenue in Central Park opened to front-page fanfare in the New York Times. It was designed by the aptly named M. Betty Sprout and her colleague [and future husband] Gilmore Clarke, landscape architects working with the New York City Parks Department. Created many years after Frederick Law Olmstead's and Calvert Vaux's splendid naturalistic design for the rest of the park, this fine formal six-acre garden in the park's northen end was one of the early New York City projects of the Works Projects Administration (WPA), the program established in 1935 under President Franklin Delano Roosevelt to create jobs during the Great Depression. The Conservatory Garden takes its name from the complex of large glass conservatories (greenhouses for floral display) built on the site in 1899 and taken down in 1934 because of their high maintenance costs. Under the direction of Robert Moses, parks commissioner from 1934 to 1968, the garden was built in their place. 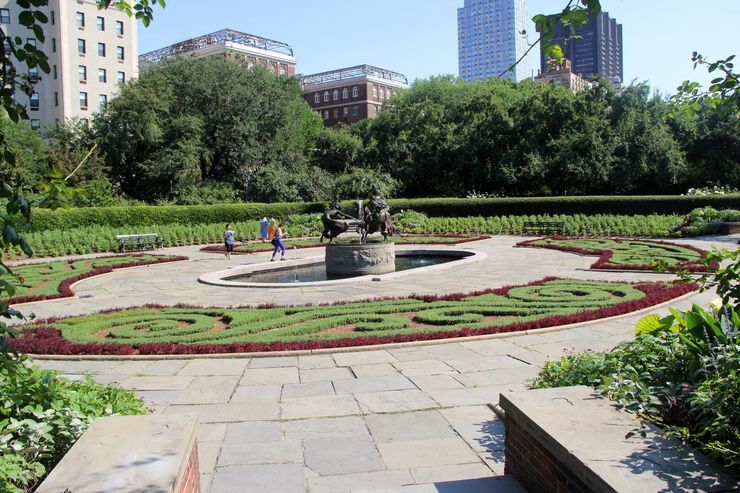 Moses hired hundreds of gardeners to work for the Parks Deptartment — many of them Italian immigrants who had lost their jobs at the great estates around the city during the Depression — and some of them worked in this formal garden. Betty Sprout divided the Conservatory into three sections, each inspired by a different European design tradition. She designed the North Garden, rather French in feeling, to have two spectacular seasonal displays, with its large rectangular lawn and clipped yew hedges, is elegant and green all year except for one week in May, when double pink-flowering crababbles bloom. The South Garden was designed to display mostly perennials and annuals, and it resembles an English Garden in style. Note that the ornate wrought iron gate on Fifth Avenue just south of 105th Street was not a New Deal creation; it was donated by the Vanderbilt family, which also payed a private contractor to install it (see press release). New York City Parks Department press release of September 17, 1937, announcing the opening of the Conservatory Garden, characteristically giving no credit at all the the WPA. Miller, Lynden B., Parks, Plants, and People: Beautifying the Urban Landscape, W.W. Norton & Company (2009), pp.19-20. Lyall, Sarah, Garden in Central Park is Reborn after Neglect, New York Times, June 11, 1987. Morrone, Francis, Three Gardens in Central Park, The New York Sun, January 26, 2007; also in: Lynn, Robin, and Francis Morrone, Guide to New York City Urban Landscapes, W.W. Norton Company (2013). Gilmore D. Clarke Obituary, New York Times, August 10, 1982. New Deal Assistance in NYC Parks Department Projects, 1934-43. Conservatory Garden (Thomas D. Price, 1936-37). Entered from stairs at Fifth Avenue and 105th Street, this six-acre formal garden was originally designed by M. Betty Sprout and Gilmore D. Clarke. It replaced a group of glass conservatories that occupied the site from 1898 to 1934. Constructed by the Works Projects Administration, it incorporates an ornamental gate commissioned for Cornelius Vanderbilt II's Fifth Avenue mansion in 1894, as well as sculptures by Walter B. Schott and Betty Potter Vonoh. The landscape was restored by designer Lynden B. Miller in 1992.